Brace yourselves! This month, we’ve decided to change up our favorite home theater design ideas. Instead of showcasing elaborate, out-of-this-world custom home theaters, we are going to show you how to make the most out of LESS. That’s right. Your home theater doesn’t need to be large and grandeur to be incredible! Some of the most amazing moments are right in the comfort of your own home, regardless of the size. Our home theater design ideas for this month are keeping budget in mind, so you don’t have to break the bank to have a mind-blowing cinema experience. Simple, comfortable, and realistic. Is it the easy access wine cellar or the 10 foot screen projector that makes us crazy about this design? No movie night is complete without uncorking a bottle of fine wine! The highlight of this home theater is the wine cellar, which is enough to grab the attention of any wine lover! This easily attainable design comes complete with overhead light fixtures, sensible storage, and, of course, fashionable mini beverage tables. The neutral color scheme makes this design suitable for a variety of homes. Love the feel of the theater, but not the drive, prices, or annoying audience members? Stay within the comfort of your own home with this perfect design! This home theater is ideal for the whole family, but not too over the top! The red walls and floor, along with the dimmable wall lights completely transform this intimate sized room into a theater. For an extra effect, consider adding in wall-mounted speakers to intensify every action that occurs in the film. He shoots, he scores! If you’re a huge sports fan, this theater design is a dream come true. Equipped with a full sports bar and multiple TVs, you’ll never need to leave the house to watch a sports game...ever again. This design even has a scorekeeper above the media wall so you never have to squint to catch a glimpse of the score. This sports heaven is actually located in a pool cabana, but can easily be an inspiration for your home theater. Have that room in your home that just never gets used? Turn it a beautifully styled movie room! We love this idea because this is a very normal sized room that holds so much potential. This room can comfortably fit the whole family! Consider adding the Seatcraft Cuddle for the ultimate comfort! Add the adjustable LED colored lights create a fun ambiance the whole family will enjoy! WARNING: The following design is NOT intended for those who fall asleep during movies! This design might be too comfortable for you and could cause excessive sleepiness. Who doesn’t love the idea of laying down while watching tv, or a movie? 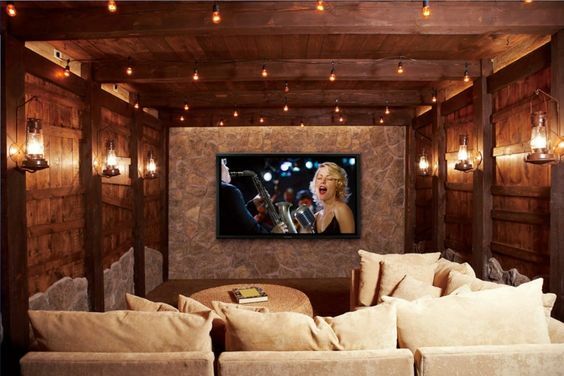 Take your home theater to the next level while still utilizing a smaller space with this super cozy theater design. We love everything from the LED accent lights to the eccentrically patterned carpet. The sconces and wall color add a regal essence to the design. The possibilities are endless, even if you have a small space. This whimsical design brings the magic back into watching a good film. Have you had a hectic week? Well, wind down by sneaking away to this hidden gem and get lost in a marvelous film. The hanging lights and lanterns set the mood for a romantic evening with your significant other. Make this design even cozier by adding in a fireplace or pellet stove for a complete european cottage vibe.